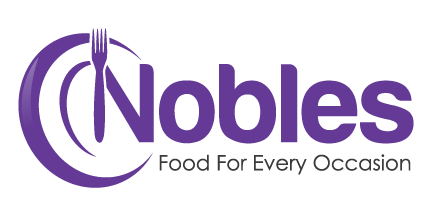 Nobles Catering is owned and run by Fiona Dodd-Noble. Here is her history. I was brought up in Ayrshire on the west coast of Scotland. I left catering college at seventeen with an advanced diploma, and began my cooking career travelling all over Scotland, cooking mainly in game lodges, which proved to be quite testing. Cooking in Victorian kitchens with very little equipment was an excellent training, having to think on your feet and work with many different people. When I was 21 I travelled to Australia for eighteen months. This was my first introduction to outside catering. The company I worked for specialised in cooking in offices that did not have a kitchen! We would go armed with everything. I would be sent miles into the outback to cater for large parties and then I would find myself trying to cook on boats in Sydney harbour, or make lunch in a lift. It was a huge experience for me; so varied, achieving what I would have considered impossible, and unlike England, the weather was always on our side. I was introduced to so many wonderful new ingredients, and coming from Scotland where even an Aubergine was bizarre, this was a feast of new ideas that have proved invaluable to me to this day. A short while after my return to England I met my husband Antony, and we married in 1988. At that time I worked at the White Elephant Club in Curzon Street. It was a job of such variety. I filled in where ever I was needed, organising parties, assisting the chef, greeting the guests to the restaurant (many of whom were “A” list celebrities), and walking the boss’s dog! It was a fantastic experience. Sadly the club, a family business, closed. For the next eight years I catered for director’s dining rooms, and cocktail parties. It was a very busy time and I was often doing three lunches in one day. The outside catering became very busy, catering for parties all over London. My business began to take over our small London house, and I had to make a decision as to weather to let the business grow larger by moving to a business unit or to move on to greener grass. As neither I nor my husband came from London, greener grass seemed the preferable option, and in 1997 the opportunity arose to buy a delicatessen in Tisbury, Wiltshire, and in late 1997 we moved to Wiltshire. The shop was Nobles Delicatessen, and it was a delightful shop, very much loved and we had so many fantastic customers. My husband built me a fully equipped kitchen, and we cooked all our own foods for the shop. We had an enviable reputation for our range of new food products; our cheeses were popular for miles around, and I was soon very busy with the outside catering. Sadly though, the intense workload, high staff costs, and the meagre earnings made it all too impractical, and in late 2002 we reluctantly closed the shop, but the catering continued. I have now returned to my favourite aspect of catering, and that is the more personal world of exclusive event catering. I love food, I love the thrill of catering, and I love to see a client delight in their party. That is what I love most, and that is now what I do the most. We now live in a dear cottage 3 miles from Tisbury where we have enough land to grow many of the vegetables and herbs I love to use for my cooking. We have a hugely successful poly tunnel, 30 chickens, who supply us with all our eggs, two Kune Kune pigs, who are my lawn mowers and dear friends, and two springer spaniels, who keep me fit; something which is essential and which allows me to cope with an ever busier business. But it is a business which I thrive on, as I adore providing delicious food for any occasion.